One Saturday morning in the spring of 1961, I faced one of the most agonizing decisions of my young life. Earlier that morning, my mother had given me my weekly allowance of $1. With that dollar bill burning a hole in my pocket, I hurried downtown to the hot spot for record sales in Spokane, The Music Box, where I began scanning the wall racks for a “45” to buy. I narrowed my choice down to two records—“Surrender” by Elvis and “Blue Angel” by Roy Orbison. I only had enough money to get one, so I had to make a decision. In a booth I listened to both records over and over, and after changing my mind several times, I put my dollar bill on the counter and walked out with … the Roy Orbison record. It wasn’t just my allowance that Presley and Orbison competed for in those days. From 1960 through 1964, the two singers battled for supremacy on the pop charts. By 1963 Elvis had won me over to his side, but I remained a fan of Orbison, as well, until the “British Invasion” sent him tumbling down the charts, along with many other successful pre-Beatles American acts. From his early teens, Roy play his guitar and sang for small audiences around Wink, Texas, where his family lived. After graduating from high school, his conservative values led him to enroll at North Texas State University at Denton near Fort Worth. He was soon infected, however, by rock ’n’ roll, as it swept its way across the country. He’d heard Elvis’s “That’s All Right (Mama)” on the radio and heard talk about his wild stage show. While Presley’s gaudy appearance and wild stage antics challenged Roy’s conservative upbringing, the music converted him. “I really loved hearing it and couldn’t wait for the next records to come out,” he admitted. “At the same time, I was kind of ready to go myself.” And so Orbison’s local band, the “Wink Westerners,” included a couple of subdued rock ’n’ roll numbers in their country repertoire. 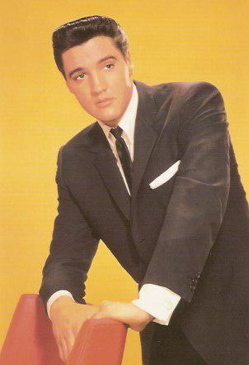 To promote the new Sun single release, Bob Neal, Elvis’s former manager, arranged a tour in the summer of 1956 for Roy and the Teen Kings, with Johnny Cash topping the bill. Roy would never forget what happened at one show in Memphis that summer. At the conclusion of Roy’s set, Elvis ambled on stage. “Marvelous show,” he told the wide-eyed newcomer. “Well, I’ll tell you one thing,” he added. “You’re that good that I’ll never appear on stage with you.” The polaroid photo taken of the two singers that night became one of Roy’s treasured possessions for the rest of his life. 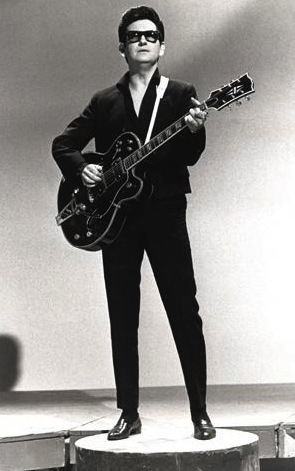 Between 1960-1964, Roy Orbison placed 28 songs in Billboard’s Hot 100. Two of them, “Running Scared” in 1961 and “Pretty Woman” in 1965, got to #1. Others reaching the top 10 were “Blue Angel” (#9), “Crying” (#2), “Dream Baby” (#4), “In Dreams” (#7), “Mean Woman Blues” (#5), and “It’s Over” (#9). 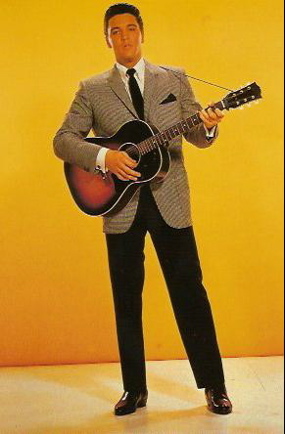 With the arrival of the British acts on the American charts in the mid-’60s, Orbison’s record sales dropped, causing him to concentrate on touring for income. He appeared all across the U.S., but crowds in England and Australia were more receptive to his brand of music. Unlike Elvis, Roy found Las Vegas a heartless place to work. “If you do well in Las Vegas, they cut the show short because they want to get the customers to the tables,” he noted. “Vegas is there for the gambling; it’s no place for an artist despite the big money you can make. 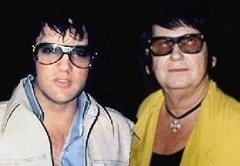 It was in Las Vegas, though, that Roy Orbison and Elvis Presley met for the last time. 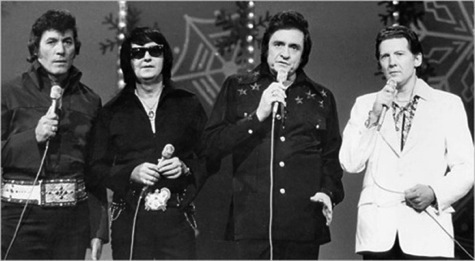 One night in December 1976, Orbison was closing his show at Caesar’s Palace, when Presley suddenly came on stage. Elvis announced to the crowd that Roy Orbison was “quite simply, the greatest singer in the world.” The remark was probably born more in his admiration for Roy than reality. (Elvis had made similar claims about several other entertainers in the past.) It is certain, though, that a friendship and a mutual feeling of admiration existed between the two Sun Records artists, dating back to that first on-stage meeting in Memphis 20 years before. In 1986 Orbison returned to Sun Studio along with Johnny Cash, Jerry Lee Lewis, and Carl Perkins. In what was billed as a “Million Dollar Quartet” reunion, the four Sun legends recorded an album with Roy sitting in for Elvis. The following year, in just its second induction ceremony, The Rock ’n’ Roll Hall of Fame opened the door for Roy Orbison, with Bruce Springsteen making the presentation speech. By then, though, time and a weak heart were catching up with Roy Orbison. In 1978 he had undergone triple-bypass heart surgery. On December 6, 1988, his heart gave out for good. He was dead at the young age of 52. 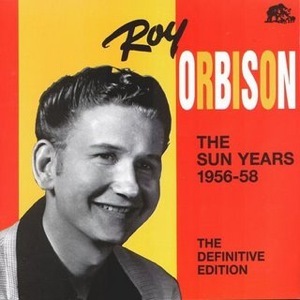 Roy Orbison never became a rampaging rock star like his fellow Sun Records mates Elvis and Jerry Lee. He lacked the sultry looks that attracted girls, and his conservative values wouldn’t allow the drug use, womanizing, and bizarre behavior common among rock stars. With just his music alone, he made a place for himself in pop music history. "Roy was enchanted to be in the King’s court; a confidant of the person, only a year older than himself, who’d become the voice of teenage escapism and aspiration."